Went to the big mall in Cabo Saturday, had to pick up shipping supplies so Dan and I thought we would scope it out while we were in town. http://www.goldenzonecabo.com/?page_id=200 The mall is called Puerto Paraiso and is a three story mega mall with high end shops, an inside level, and two outdoor levels, with a marina and really great restaurants. It is not inexpensive, but a fun splurge for sure. We have had all kinds of fantastic local cuisine since we have been here so opted for something easy and nostalgic for lunch at Johnny Rockets. Oh my. Best Banana Malt. Ever. I love our local book store and coffee/juice bar El Tecolate, keeping us all in books and Kate even has a trade in/exchange which makes it kinda like a library, a great perk.The shop can be found on the main strip before you get to the Hotel California. We were introduced to Bistro Magico a couple of weeks ago, a little restaurant, two-person operation, with beautiful food. I always go with the special of the day when we go cause I dont want to miss out, each meal is carefully designed with love and attention and the finest ingredients, you will be gald you tried this place out, happy to recommend. The smoothies are fantastico too. Our Puravida needs a mention too! This is a Health food store/ Boutique/ Restaurant in Todos Santos, includes great juices and smoothies. Owned by Joella & Kurtis, the boutique section is filled with luxurious hand made bathing suits and wraps designed by Joella, she is very talented! I own one of her suits and it is well made and designed to be flattering and comfortable to frolic in the ocean in, excellent. Just found Nomad Chic this last week, a cute boutique on the main strip with some great imports, got some incense and a cute tank. Owned by a really cool gal from Portland Oregon. There are a lot of really great places still to check out in town, but I am thrilled with the gems I have run across so far, Todos Santos has style. 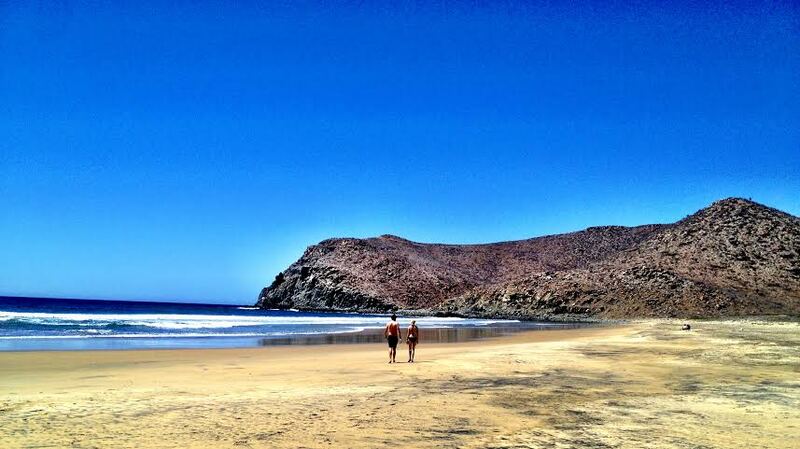 As far as beaches and the magnificent momma ocean go…. 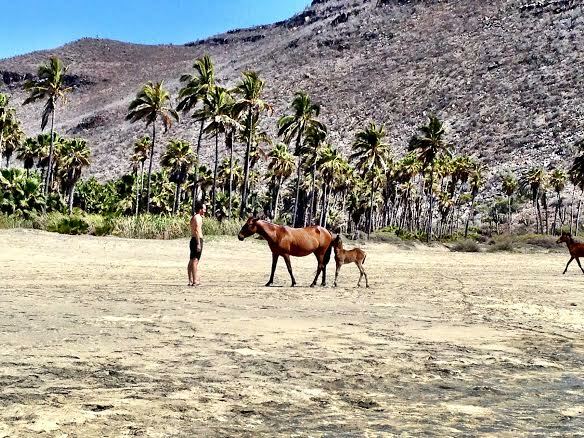 have been to Cerritos beach and a hidden beach called Playas Las Palmas (where we shared the beach with the friends who brought us – Casey and Jim – about 30 other friendly people scattered like salt across the stretch of white glittering sands, and a family of wild horses. I call them wild, they are free range, beholden to no one, beautiful, and amiable, yet alert and aware of the human factor). I recommend any place you can see the ocean from, feel the ocean from, hear the ocean from…. the water is refreshing to the soul. Getting a tad warmer every day too.